One of the more fun parts of getting a new boat is deciding on her name. Now, one might say.. Hey! Wait one darn second. It should retain it’s original name. Correct you are Mr correct pants. BUT. In many cases like this one, there is no history of an original name. 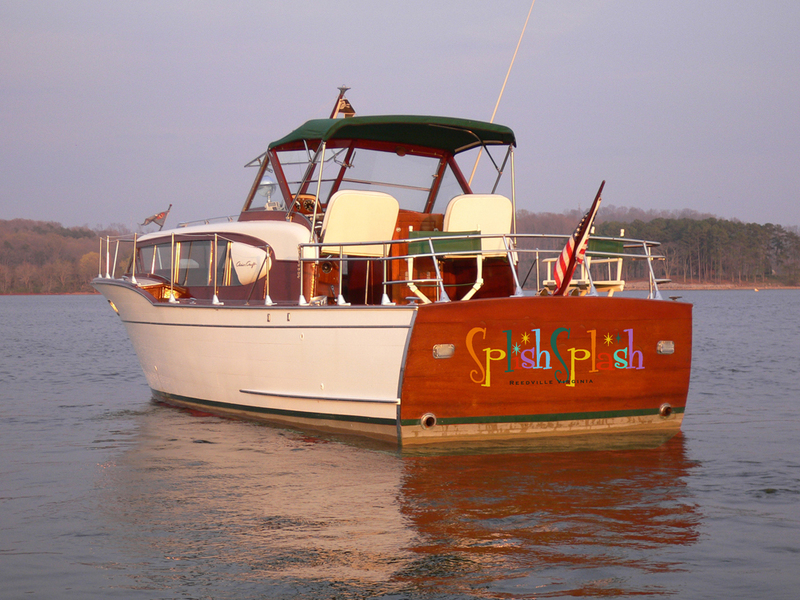 The boat was renamed in the 1990’s during a restoration, so that sets us free to have some fun. We have narrowed it down to two. One is very sentimental, the other fun and reflective of it’s and my birth year 1958. Each one has a story, and I thought it might be fun to include the citizens of Woodyboaterville in the choice. So once you read the options, you can vote on the little survey deal on the upper right hand side of this web site. On the surface this may seem like a very simple and plain Jane name. And it is.. BUT. Here at home we name our boats after folks that are key to the boats survival. Like naming a wing at a University or Museum… Our barrel back was named after my Grandmother Sylvia who told me to do something stupid with some of the money.. She would be proud to know that I did just that. In this case, my wife and I, if we to have had a little girl back in the day wanted to name her Betsy.. A simple name. So that came up in the conversation of names… OK yawn… I get it, and we moved on. UNTIL I spoke to the folks that restored this boat back in the mid 90’s. Turns out the only reason the boat was saved was because of the owners mother, a very well known artist in Knoxville Tenn. Yes… Betsy Worden… Sadly Betsy passed away in 2006.. Now it get stranger… My mother was also an artist passed away in the exact same way. I got a chill when I found this out….The karma points on this one are to big to ignore. Ok, this one is more fun and conceptional. Splish Splash was a hit song in 1958 the year the boat was made. The graphics are a ton more fun and fit the period of the boat. On a sentimental vote, we used to sing this to our kids when we needed them to take a bath and has always been a brighten your day song that my wife and I hum…It also represents the real reason for the boat… FUN…and Cocktail Hour… mmm Ice Tea with a splish of something and a splash of something else…So it feels right for the boat. So chime in, vote and help me through this. We are putting the name on tomorrow, so vote now. I woke up, made my first cup of coffee, opened the blog, read "name the boat". Instantly thought "Cover Girl". One of the reasons you purchased the boat. The site continued to download and I then found you were already down to two choices. Go for the spish splash. I would never have the balls to do it on my boat! Matt,go with Splish Splash ,you'll be glad you did when you get a hole in her…. I'm torn, I like the karma thing. but people will remember Splish Splash. I vote Splish Splash. Splish Splash – irreverant and not too serious – just like the attitude you bring to the blog. Betsy – Old, stodgy and sort of irrelevant – which would you rather be – irreverant or irrelevant? For the entertainment of your US followers I include a link to a currently popular commercial for a CDN phone company. It features a wallowing and ungainly hippo, and your new favorite 1958 song, sung by an Italian. Is there a connection between the your boat, the song and the Hippo? Splish-Splash. Since none of us has the guts your's will be the only one…..that we make fun of. I'll vote against the grain on this one – BETSY. BETSY is "old, stodgy and sort of irrelevant". Seems fitting. Call me sentimental, but boats to me are just that. You said you got a chill when finding about about the passing of the owners mother? And she was the one who saved the boat? And BETSY was to be the name of your daughter? The "signs" are definitely pointing me toward BETSY. I agree with Chad's comments – My vote is for BETSY. John Rothert votes for Besty….since it will cost less to have Crunch paint…save $ where you can my freind…you have just stepped into "cruiser world" with both feet….lol. Around the same time in history the Betsy Wetsy doll was introduced. Every time I meet someone with that name I wonder if they needed a diaper change. Anonymous from 2 posts back votes for "WIDE LOAD" in gold leaf. Heres my five cents worth. I love the classic true to period Betsy. It looks 'right' on the transome .The typeface is perfect. The story is sweet. ACBS would approve Im guessing. Very sensible. But, Splish Splash is fun and different and looks very cool. Its also true to the 58 era. Its going to make people smile long after youve got uesd to it. At first I thought it seems like a better name for a small boat. Like an outboard but then I quickly thought hang on its even better on such a big boat. Like casting against the part it gives the boat charcter just like its owner. I vote Splish Splash. Phil. …a song about a dude in the bath-tub, walking out to find a party going on in his living room? That's how you want to honor your new classic boat? Listen to the lyrics "The Ballad of OLE' BETSY" by the Beach Boys and you'll hear a more fitting tribute. Are they only two choices? They both seem fairly lame in one way or another. But, if I had to choose I would go with Betsy, I guess. You could save some money in paint and artist fees and just take the "WIDE LOAD" banner from the trucker and staple it to the transom. Betsy just seems right to me and it looks good too. I really like the personal connection with Betsy & it looks great. I am stodgy. But, after listening to 5 different versions of Splish Splash, doing the 1950's cocktail thing could really be fun! Stocking her up with vintage bar ware, learning to make Zombie's & you dressed as Elvis will be great fun! After all,it is the new Woodyboater boat show headquarters, right? I am trying to figure out how Crunch is going to do "real" pink, green, and red gold leaf lettering. I like the name, but it looks like a vinyl sticker on the back of the boat…even if it is hand painted. I would go with Betsy. But what do I know, my whole family just calls our boat "The Wood Boat" regardless of what is on the transom. For what it's worth, there are 3 Splish Splashes and one Betsy in the ACBS Directory. Matt, I can't help myself. The designer in me says that to pull the over-the-top 50s typography off—complete with Sputnik twinkles—there are just too many things that don't work. If you go back to the original aqua cabin top, and ditch the hunter green Sunbrella bit…it works. Starts to look totally 50s then. But as it stands now, the type treatment looks like lipstick on a pig. (Sorry for the Iowa reference). I know you're a designer too. You could flame me here. That's OK. I like Betsy 'cause I like the tie to a human. I once told you I thought of naming all of my boats after the men who once owned them, thinking they would get them restored some day. Well…someday never came, and here I am with their boats. I feel a certain responsibility with that. The only problem…if I carry through with this naming scheme, my barrelback becomes Larry, and the Gar Wood Adolph. Might have to rethink that! ha, I agree 100% the plan is to change the top to the org blue and do the pink interior. I like Larry as a name. Thats great. "Betsy Wetsy" would be a pretty funny name. It is like a combo of the two names. "…..HOW WAS I TO KNOW THERE WAS PARTY GOIN ON?:………………….. HA! Now Phil that is funnyy. Matt I dare you to go with a pink Sunbrella top. You'd be the talk of the river. Matt, you gotta honor your mother…go with Betsy! Matt, I see the impostor Phil has poped up again a few posts above me!!!!!!!!!!!!!!!!!! !